They are late bloomers, brightening up the garden in late summer and fall, and blooming until frost. They attract butterflies, moths, bees, and even birds if they're left to go to seed. 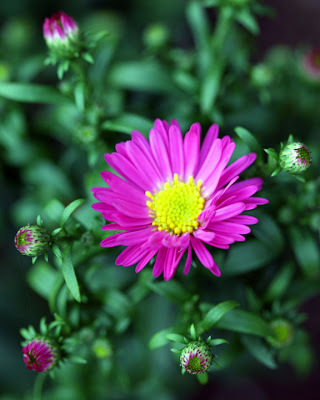 If you divide your Aster plant every two or three years, it's appearance will benefit. Divide plants in the spring once they have finished blooming: remove older less healthy areas and replant the fresh, newer growth. Watch out for powdery mildew: don't crowd plants, as this will prevent air circulation, and try to keep the leaves dry when watering. Asters can grow in zones 4 - 8. "Aster" is Greek for "star".